Since 1970, Fresno Metro Ministry has actively advocated for the health and well-being of our community. Join us in in honoring our longstanding history of community action, as we enter a new era of "Learning, Connecting and Engaging to Achieve Healthy People and Healthy Places." As community conveners it our goal to ensure cross-cultural communication. Own this useful guide of nearly 350 local and regional organizations and agencies. Metro believes that a strong and healthy food system is a foundational component to healthy people and healthy places. An Urban Design Project To Achieve Healthy People & Places on Blackstone. The Healthy People, Healthy Places Network builds on our long-term work in the region to improve air quality, land use patterns and public health in the 8-county San Joaquin Valley. Stay on top of Metro’s exciting new projects and upcoming events. Our E-news comes out monthly and covers the latest happenings within our programs. Your tax-deductible contribution will help support our three core programs that work together to build and sustain a long-term vision for an active Healthy People and Healthy Places Network in Fresno and across the San Joaquin Valley. 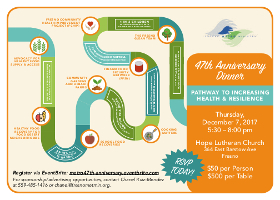 Metro is so proud to celebrate 47-years of advocating for the health and well-being of Fresno and the Valley! This year, our celebratory fundraising efforts are focused on a “Pathway to Increasing Health & Resilience” through Metro’s Food to Share program.